Cathedral fire poi heads move slightly slower through the air compared to other head types because of their flat sides. This tends to compliment slower spinning styles. The important factors to consider when selecting poi are flame size, burn time, chain and handle types, and minimized exposed metal on the heads. All cathedrals are 2” x 2" wide, with height designated by name. Example: 3" cathedrals are 2” x 2" wide and 3" tall. 2" Heads are the smallest, lightest fire heads we make, burn with the smallest flames, and have the shortest burn time of all our poi heads (~3:30 minutes*). They function as a great first pair of poi, though their light weight can make some moves like stalls and tosses difficult. While more comfortable with smaller flames at first, many spinners find they desire heavier heads with larger flames after a few months. 3" Heads are a good "average" size poi head, with a medium-sized flame and burn time (~4:00 minutes*). We highly recommend them as first fire poi sets if you are unsure of what you may want. 4" Heads have a large flame, but are lighter and have a slightly shorter burn time (~4:30 minutes*) than our other large heads such as our 3" Cherry Bombs and Large Monkey Fists. For safety reasons, the wicking layers are held together on the bottom by four recessed rivets, at the top by a wide hidden washer, and inside with a steel eyebolt and two mechanically locked nuts. There are three choices for chains: Technora, link chain or ball chain. We use stainless steel chains, swivels, and split rings for the greatest strength and durability. Ball chain is our lightest, less expensive option. It is great for beginners because of how easily it untangles (usually tangles can be lightly pulled apart). Because each ball link turns independently of one another, swivels are not needed. Stainless steel #15 ball chain (what we carry), surpasses the load requirements and corrosion resistance needed for typical fire use, and is stronger than the cheaper nickel-plated alternative. Twist link chain is the slightly heavier and stronger chain option, though it feels slightly smoother when spinning. This chain catches on itself slightly when it tangles which makes moves like Hyperloops easier. We add a ball bearing swivel just above the poi head to minimize chain twist, and use heavy duty stainless steel split rings (far stronger than normal keychain split rings; nearly impossible to open without “split ring pliers") to connect chains to swivels and quick links. There are four choices for handles: Nips, Poms, double fingerloop and single fingerloop. 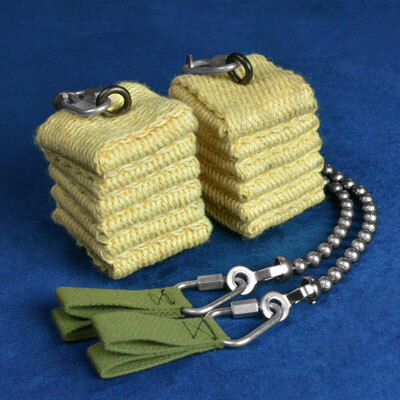 Double Fingerloop Handles have loops typically used on the index and middle fingers. These cotton loops provide a solid, constant connection between you and your poi chains. Single Loop Handles have a single large cotton loop that partially inverts to tighten on two fingers more snuggly than double fingerloop handles can. Nips and POMs are made from a grippy, high-temp rubber. They are weighted and shaped for tosses, and both have holes through the middle for leash attachments or to put swivels under. Nips have a deeper cavity, a ribbed grip surface and an extended from to keep the leash from rubbing against your fingers. Total Poi Length is the length from the bottom of the poi head to the top of handle.